Virginia Gov. Ralph Northam (D) defends his ability to lead and heal the state’s racial wounds in his first on-camera interview since the revelation of a racist photo that threatens to derail this governorship. “Right now, Virginia needs someone that can heal. There’s no better person to do that than a doctor,” Northam says in an interview with journalist Gayle King, excerpts of which were aired at the start of CBS’ “Face the Nation” on Sunday. “Virginia also needs someone who is strong, who has empathy, who has courage and who has a moral compass. And that’s why I’m not going anywhere,” Northam says in the interview, which will air in full Monday on CBS. Northam’s comments echo those he made in a Saturday interview with The Washington Post, where he vowed to devote the rest of his governorship to advancing racial equity in the one-time heart of the Confederacy. Near the beginning of the CBS interview excerpt in an exchange with King, Northam notes that this year is the 400th anniversary of the first “indentured servants from Africa” arriving in Virginia. Northam’s reference to slaves as indentured servants sparked some outrage on social media. “Virginia deserves a governor that knows the folks who were stolen from their land & brought to present day Virginia on cargo ships in 1619 were not ‘indentured servants’ they were mothers, fathers, daughters, sons, leaders, warriors, elders who were captured & enslaved. SIGH,” tweeted Democratic operative Symone Sanders. “My G-d, it just gets worse & worse. Asked about this week in VA, Northam responds by referring to kidnapped, enslaved, & trafficked Africans as ‘indentured servants,’ tweeted Qasim Rashid, a Muslim activist who lives in Virginia. The first Africans brought to Virginia were captured in Angola and brought in a slave ship, but Virginia did not have a formal legal system for slavery in 1619. There appears to be some ambiguity over their legal status, with some still forced to work for life while others had a path to freedom, according to the National Park Service. Asked to clarify Northam’s remarks, a spokeswoman for the governor pointed to news accounts that referred to the first black Africans being treated as indentured servants before slave laws. The state is in chaos with controversies engulfing the state’s top three elected officials. Shortly after the revelations about Northam, Attorney General Mark Herring (D) admitted to wearing blackface as a college student, and Lt. Gov. Justin Fairfax (D) also faces calls to resign after allegations of misconduct. Senate Majority Leader Tommy Norment (R) also acknowledged he was an editor of a 1968 yearbook that featured racial slurs and photos of students in blackface, but said he was not responsible for the content. Northam, who is starting to appear publicly again after spending nearly a week in seclusion, addressed the scandals facing his fellow elected officials. Democratic lawmakers at the state and national level, along with the state Democratic Party, have demanded Fairfax’s resignation, but the lieutenant governor has said he will not step down. Fairfax would become governor if Northam resigns. Northam said he supports an investigation, but stopped short of calling for Fairfax’s resignation. “If these accusations are determined to be true, I don’t think he’s going to have any other option but to resign,” said Northam, who told King that he has not spoken to Fairfax since the second accuser went public Friday afternoon. Northam also offered forgiveness for Herring, who after disclosing that he darkened his face when dressing up in college has largely avoided the blizzard of calls for his resignation that have dogged Fairfax and Northam. The allegations against Fairfax have placed Democrats in an uncomfortable position: They are attempting to push a rising African-American star out of office while a white governor and attorney general accused of racism may remain. A new Washington Post-Schar School poll found Virginians were evenly split on whether Northam should step down, but black voters were more inclined to forgive him. The poll found 58 percent of African-Americans did not want Northam to resign, supported his performance as governor and accepted his apology. The polling was conducted before the second allegation against Fairfax. “I understand that he wants — that he’s feeling contrition, that he’s feeling regret. But we need somebody who — who can not only address the wrongs of the past, but take Virginia into the future. And I think he’s lost the confidence of the people in order to be able to do that,” said Wexton, one of three Democrats who flipped GOP-held House seats in Virginia in November. 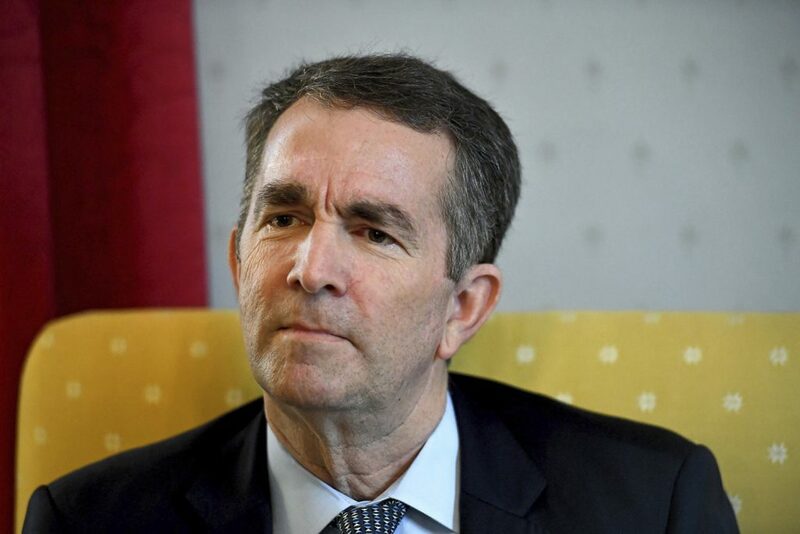 The controversy began when a conservative website earlier this month publicized Northam’s page in the 1984 Eastern Virginia Medical School yearbook where a photo of two people — one in blackface and the other in a KKK uniform — holding beers are included with photos of Northam. The governor originally acknowledged appearing in the photo and then backtracked the next day at a nationally broadcast news conference, where he said he did not believe he was in the photo, but did admit to donning blackface at a dance competition in Texas. The changing explanations were often cited by elected Democrats in their calls for Northam to resign and, according to the Post poll, struck most voters as unbelievable.